Toxic link cleanups and disavows are one of the most overblown crocks of BS in the entire SEO industry. I’ve seen various “SEO Experts” and agencies spend months if not years “cleaning up toxic links”. 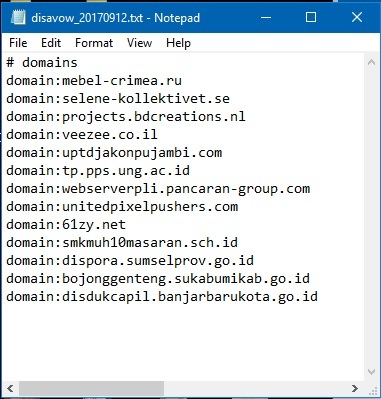 If you have links pointing at your domain that you don’t want pointing at your domain, you simply go to Google’s Disavow Tool and upload a properly formatted .txt file of the links you don’t want. If you go looking around online for an example of a disavow file you will find all kinds of how to guides full of useless information and what to do / what not to do / when to do it / blah blah blah. The truth is, Google ignores most bad links. I have personally talked to dozens of website owners who have been told they need these services when they do not. In fact, I wrote about it here: Deceptive Disavow Services. In other cases, it makes sense to disavow links to be on the safe side, especially if there are a significant number of them. You probably do not need to disavow your links. If you need a second opinion feel free to contact me as I’ve seen hundreds of link portfolios going back 25 years. Don’t disavow “http://” or “www.” or you’ll get an error. Don’t bother adding notes to the txt file – the file is fed into a machine and there is no human intervention involved. Be sure to include domain: in front of the domain as seen in the pic. Just disavow the domain, not the individual URL. If you must disavow a URL replace the “domain:” prefix with “url:”. Is there more to it? Sure. Most people disavow link because their website performs poorly. Chances are you’re not ranking due to a lack of good links, not due to a quantity of crummy links. Still, in some cases a previous, crappy SEO company did something which needs to be disavowed, or something has gone terribly wrong on the Internet. Yes, I make it all sound simple. There is more to it. In some cases, disavows need to be taken very seriously and meticulously cultivated from a variety of sources, especially if there’s been a manual action and a reconsideration request is required. “You probably do not need to disavow your links” is an important piece of advice. Google’s pretty good at spotting what belongs and what doesn’t and every site is going to have some bad links. Disavowing is only for the pros to do. I have 2 important clients in California which had some content scraped by a weird spam network recently. They both obtained new links from around 600 very spammy domains. I disavowed the 600 domains for one and not the other. It made no difference whatsoever. Those crummy links don’t help or hurt. It is amazing how many shady SEO agencies are still selling disavow services out there, either out of deception or ignorance. Thanks for this super helpful resource.